Just as the physical body has mysterious force centers called glands, the etheric double of man possess its duplicate force centers. These force centers are superimposed in the glandular system of man. 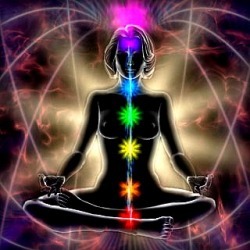 The word "chakra" means "wheel of energy". Pouring from the center of the wheel are streams of radiation, rays of energy and power which seen clairvoyantly appear to resemble the whirling spokes of a wheel. These also resemble flowers. The lines of radiation cause the appearance of petals, some chakras possess a few (the lower chakras) and other countless numbers (the higher chakras). Man has seven main chakras which lie along the spinal cord of the etheric form and these in turn superimpose the glands of man's physical form. It's through these whirling vortices of power that the life force is drawn in, enters the glands, and is distributed into the blood stream. THE ROOT CHAKRA: (RED)~ The first chakra is located near the tailbone and is associated with the body, which includes all the physical senses. Look at anything that comes up around the area of survival, manifesting, how you create and are living in the present moment. Learn to initiate and not just react, don't take simple situations as life threatening, develop and try new things, become more sensitive to other people's feelings and to not feel seperate or different from other people. THE NAVAL CHAKRA: (ORANGE)~ The second chakra is located under the naval area. It concerns how you relate to people. Look at your relationships to other people. How do you deal with mass thought forms? Explore your relationship to everyone as a whole and to other people, openness here is the ability to transcend mass thought forms, and create original ideas. THE SOLAR PLEXIS (YELLOW)~ The third chakra is located slightly above the naval. This chakra is the ego and power center. It is concerned with categorizing, separating and planning. Life from this center is seen as a "problem" with the main goal to find "solutions." How do you use your intellect, will, ego and power? How can you open to being more powerful and effective? Learn to be your own authority, learn to use power effectively, and learn to link the soul-self with the ego. THE HEART CHAKRA (GREEN)~ The fourth chakra is located over the heart. It relates to love, safety in the world, trust, faith and self-belief. It deals with attachment and detachment, the need to feel secure, validated and loved. Learn to go inward for that sense of wholeness instead of turning to others. Look at the energy of love in your heart. Are you secure? Do you trust the universe and yourself? How is your level of self-esteem and can you be open to more love in your life? THE THROAT CHAKRA (BLUE)~ The fifth chakra is located in the throat area. This is the mind and throat chakra. It is concerned with expression of self through the voice and the mind. It deals with ideals, philosophy, psychology, and the need to understand at the intellectual level. How do you express yourself? (openly or repressed?) How can you open to greater self-expression? How do you use your mind---past, present, future thoughts? Focus your energy on the "Here and Now". THE THIRD EYE CHAKRA (INDIGO)~ The sixth chakra is located in the middle of the forehead. This is the intuitive center, and pertains to visions, intuitive abilities, and symbols. How do you respond to your intuition?--with trust? (heart chakra link), by acting upon your insights (root chakra link), by expressing yourself with your voice (throat chakra link), by believing in it with your rational mind (solar plexus chakra link)? What are your psychic abilities? How can you open more to them? Are you aware of the presence of a guide? Do you have the ability to think abstractly? THE CROWN CHAKRA (VIOLET)~ The seventh chakra is located on the crown or top of the head. This deals with the ability to receive light. Are you open to the connection of your higher self? Are you visionary? Do you enjoy traveling into other realities? Do you receive images and ideas? How do you use your imagination? ***The chakras become increasingly active as the person progresses spiritually. It's through these spinning whirlpools that life force is drawn into the physical being. When a gland and its corresponding chakra become disconnected, the flow of energy into the body is obstructed. This is when illness, or depression can manifest. This is when Reiki and spiritual healing can help one's body to heal itself.